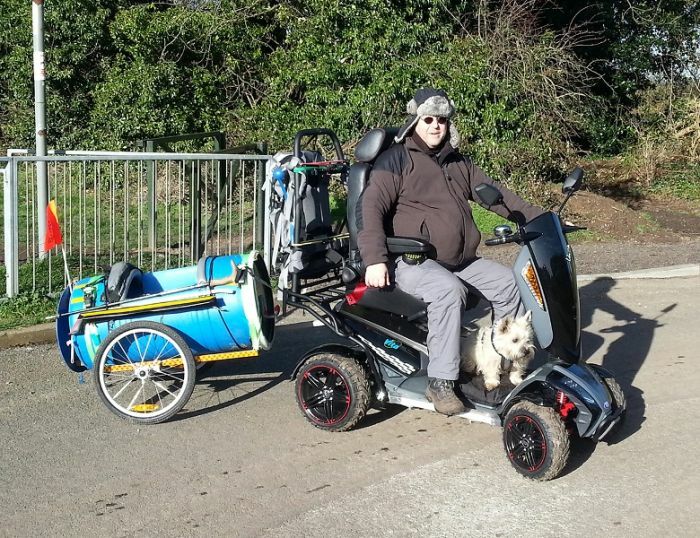 Dog owner Steven Cable, 58 from King’s Lynn, is a dedicated Norfolk citizen with many disabilities who continues to clean his local park and campaign for improved facilities. Steven was born in King’s Lynn and before having to take early retirement due to major spinal problems. He was a heavy-duty construction machinery operator and international long distance lorry driver. During a period of 30 years, Steven worked on numerous building projects that included construction of the M25, A14 and even the airport on the Falkland Islands. Steven now lives with restricted mobility and multiple conditions that include crushed spinal discs, IBS, Asthma and Basilar Artery Insufficiency. Despite his difficulties, Steven has spent the last few years dedicating every morning to cleaning and maintaining Pepper Green Park. He has also pro-actively achieved installation of new play equipment by the local District Council and organised flower planting as part of the King’s Lynn in Bloom initiative. He has been nominated for a good citizenship award and is now campaigning for improved disabled access at local parks. As his conditions have become more pronounced resulting in severe walking difficulties, Steven’s mission to help his community would not have been able to continue without the assistance of his TGA Vita X mobility scooter. As Steven lives alone, he has the ability to remain independent outdoors with his dog Bobby with the help of his TGA scooter and trailer. He travels everywhere with his four-year-old Cairn Terrier who either rides on the floor well or in the custom built trailer. Steven visits the park to collect litter and communicates with the council regarding maintenance tasks so that the environment remains pristine and enjoyable for locals. Be the first to comment on "Clean-up crusader continues King’s Lynn mission"